BEIJING, Jan. 3 (Xinhua) -- China's Chang'e-4 probe touched down on the far side of the moon Thursday, becoming the first spacecraft soft-landing on the moon's uncharted side that is never visible from Earth. 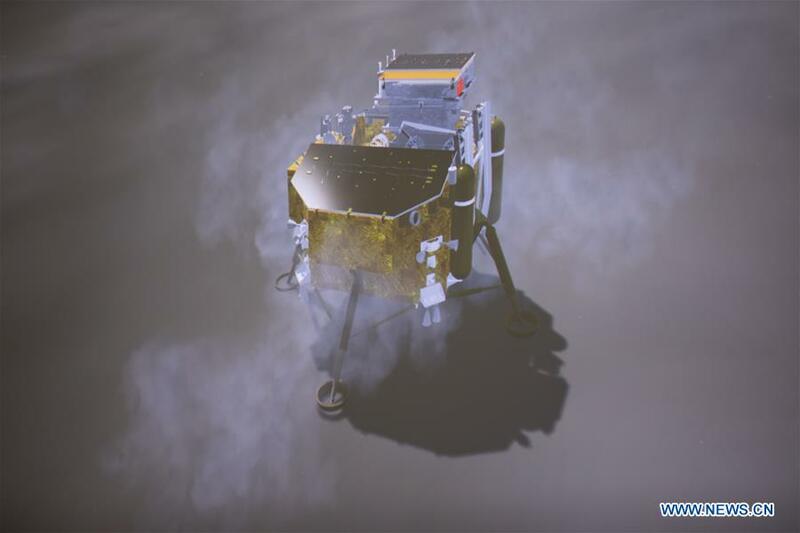 The probe comprised of a lander and a rover, touched down at the preselected landing area at 177.6 degrees east longitude and 45.5 degrees south latitude on the far side of the moon at 10:26 a.m. (Beijing Time), the China National Space Administration (CNSA) announced. With the communication assistance of the relay satellite Queqiao, meaning Magpie Bridge, the probe sent back the first-ever close-up photograph of the moon's far side, opening a new chapter in lunar exploration. After the Beijing Aerospace Control Center sent an order at 10:15 a.m., the Chang'e-4 probe, launched on Dec. 8, 2018, began to descend from 15 km above the moon with a variable thrust engine being ignited, said CNSA. The Chang'e-4's relative velocity to the moon was lowered from 1.7 km per second to close to zero, and the probe's attitude was adjusted at about 6 to 8 km above the lunar surface. At 100 meters up, the probe hovered to identify obstacles and measured the slopes on the surface. After avoiding the obstacles, it selected a relatively flat area and descended vertically and slowly.